Open to all students at F.M.S.! See official rules. Use the official entry form to design the logo for next year’s Art Fest! or download below. Choose circle or square format. Congratulations to Mar. 2019 Winner Aubrey A., Gr. 6!!! View all 2018-2019 winners in our Contest of the Month Online Gallery! • The Ford Middle School Art Contest* of the Month is open to ALL students in grades 5-8. • Art work must be on 9 x 12 inch paper (available in the art room if you need it!). NO NOTEBOOK PAPER! • You may use any materials/colors you want. • Must be your own original work (no tracings!). • Pass in your art work by the deadline to Ms. D. in the art room. • Make sure your name, grade, and homeroom # are on the BACK of the art work. • You MAY submit MORE THAN ONE entry. • You MAY participate even if you don’t have art class this semester. • ONE WINNER of each month's contest will receive a gift card for AC Moore (art store in N. Dartmouth)! • You CAN win more than once throughout the year, so its okay to keep entering the contests if you've already won. • Winners will be named during the morning announcements and should pick up their prizes in the art room. 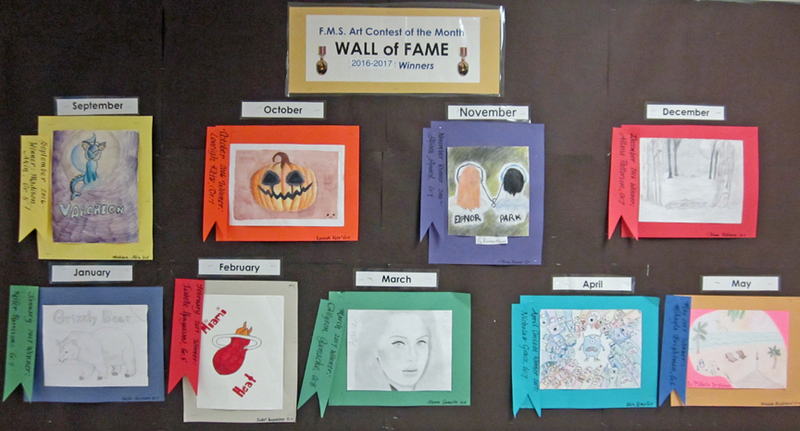 • All entries may be displayed in corridor and/or in the art room and in the Contest of the Month online gallery. Maybe this year YOU will be on the WALL OF FAME! !